IoT (Internet of Things) is the world’s fastest growing industry with billions of dollars are invested in this sector every year. 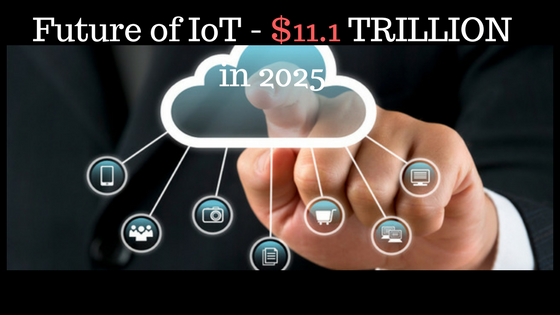 According to Garter; the estimated services spending on IoT’s in 2016 is estimated to be around $235 billion. which is much higher (22%) when compared to 2015 IoT services spendings. The IoT industry is expected to grow at much higher rate according to the report. The report estimated that the grand spendings of the IoT end-points will reach a massive $3,010 Billion before the end of 2020. Health care market of IoT will be expected to worth more than $158.07 billion by 2022 according to the report by research firm MARKETSANDMARKETS. Dave Evans, a former employee of Cisco and the co-founder and CTO of Stringify ;has predicted that there will be more than 30 billion IoT devices by the end of 2021. While according to the Gartner predictions there will be around 20 billion IoT devices by the end of year 2020 this doesn’t includes smartphones and tablets. These are some crazy numbers but we must have to take them seriously and there’s a reason behind it. The IoT statistics and growth has made it one of the most lucrative industry of employees and investors. IoT has already the essential part of our daily lives and still there are many new IoT devices are entering the market every day. Even the household essentials like refrigerators, washing machines, Gate locks, home lightnings are now controlled by a smartphone app. This is just the use of IoT in the life of a common man. There are predictions that, the expected net worth of IoT home devices market will be around $122 billion before the end of 2022. The manufacturing industry is also expected to contributing a lot when we analyze the future growth of IoT. IoT in a factory is enhancing the overall efficiency, while monitoring health, safety and maintenance needs. The implementation of IoT’s at work environment is already growing at a rapid rate and expected to reach $913 billion by the end of 2018. IoT is controlling the aspects of various infrastructures, which includes Rails, traffic signals, Water, gas and electric distribution in one way or other. IoT is sending status updates on real-time basis which ensures the smooth and flawless operations of infrastructure throughout the city. There’re various countries like Qatar who may be spending a lot in coming years on their infrastructure projects. The expected growth according to surveys on Infrastructure IoT’s will be around $133 billion in 2019.